Mt. Fuji Hostel Michael's is the newest Hostel in the Mt. Fuji area, opened July 2010. Located in Fujiyoshida City the base of Mt. Fuji. Mt. 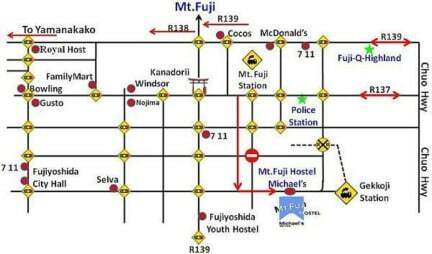 Fuji Hostel is just a 5 a minute walk from Gekkoji train station or a 15 minute walk from Mt. Fuji train station, you can also take from Mt. Fuji train station a taxi for about 760 yen to our Hostel. We have English speaking staff who can help all your travel needs during your stay with us. Mt. Fuji Hostel Michael's is a Non-Smoking Hostel but we do have a smoking area outside on the patio. We have no common area, However we do have Michael's American Cafe & Pub a complete Cafe & Pub downstairs, this is our common area to enjoy good food & drinks plus meet many of the local people from the area. This is also run by the same owner. Free Internet & WiFi, Skype, & Office 2010 (English ver). Free Key Lockers, Free morning coffee, Tea. Mt. Fuji Hostel Michael's is a Great place to come relax, enjoy Mt. Fuji with your family and friends. Enjoy the local area with the best service we can provide you. Quiet time is from 12:00pm (midnight) to 6:00am. Children under 7 years old are not allowed.